People tend to have some pretty strong feelings about beets. They either like beets or loathe them. Those who loathe them say that beets taste like dirt. I happen to like beets and prefer to describe their flavor as "earthy." But behind that earthy taste is a delicate sweetness. In fact, it was discovered sometime around the 18th century that sugar could be extracted from beets (Napoleon Bonaparte ordered 70,000 acres of beets planted in his domains when he learned that little fact). By 1880, Europeans were getting their sugar more from beets than from cane. This changed with World War I, but even today, about 40% of the world's sugar is derived from sugar beets. 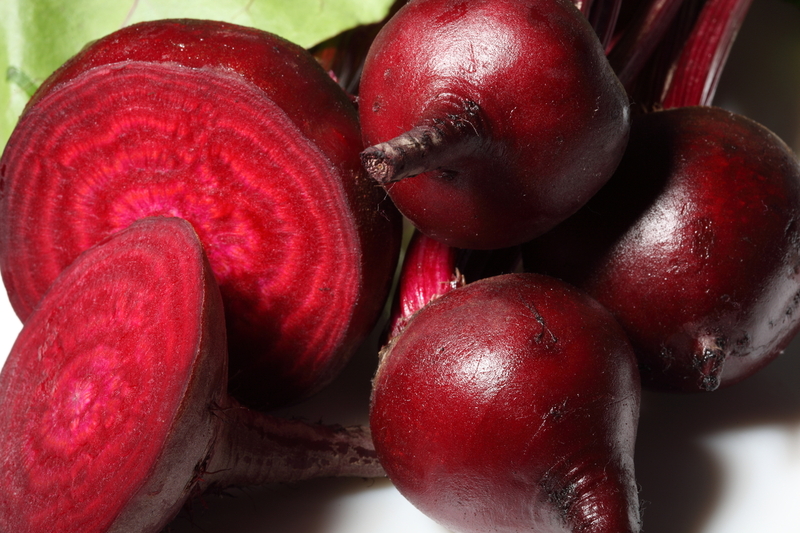 Beets are a good source of iron, dietary fiber, and potassium. 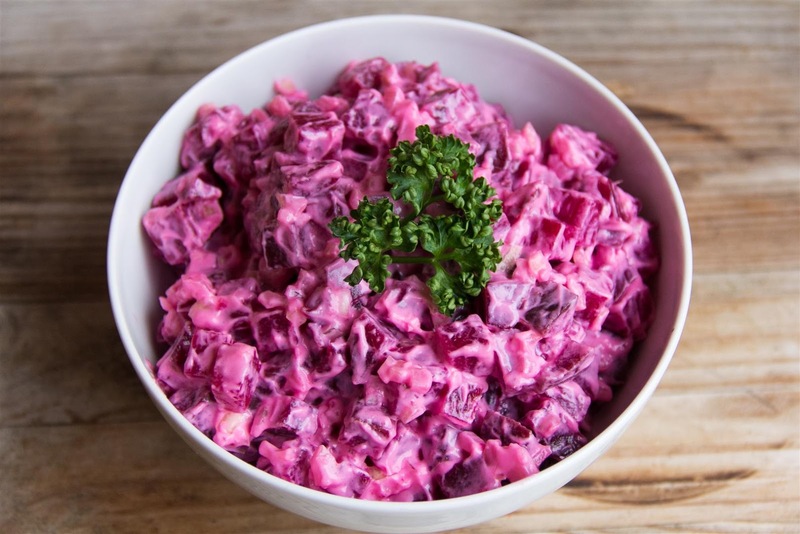 1 cup sliced cooked beets contain: 27 mg calcium; 65 mg phosphorus; 1.3 mg iron; 518 mg potassium; 4 g dietary fiber; 7 RE vitamin A; 6 mg vitamin C; and some thiamin, riboflavin, and niacin. Beets are an excellent source of folic acid. Folic acid is very important for pregnant women and women of child-bearing years to consume. Folic acid (or folate, as it exists in food) is vital for the health of unborn babies. It helps prevent spina bifida, a birth defect of the spinal cord, as well as other brain and neurological defects. According to the Spina Bifida Association of America, almost one out of every 1,000 infants in the United States is born with spina bifida each year. Folic acid reduces the incidences of these defects by 50 to 75%. The recommended amount for women is 0.4 mg every day at least one month before becoming pregnant and during the first 3 months of pregnancy. According to the April 2000 issue of Obstetrics & Gynecology, folic acid may also help prevent miscarriages and Alzheimer's Disease. Beets are also known to be good for the liver and are often eaten during fasting periods (in the belief that they help cleanse the system). Pagan religions say that beets ensure long and healthy lives. I will admit that plain boiled beets can be a bore. They do require a little dressing up—but not much. Believe me, given the chance, beets can rise to the occasion and provide lots of delicious flavor. And the color will liven up any dish. Below are some easy recipes...hopefully, those of you who have shunned beets will now embrace them. Enjoy! Grate beets and cucumbers; chop garlic cloves finely. Combine all ingredients and stir in mayonnaise. Separate the head of leafy green lettuce into individual leaves. Wash and blot dry with paper toweling. Gather half the leaves together and then cut crosswise into 1 inch wide strips. Repeat with the romaine lettuce. Alternate whole leaves of the lettuce and romaine around the inside edge of a large salad bowl. Fill the center with shredded lettuce and romaine. Cover with damp paper toweling. Refrigerate until serving time. Scrub and cut the cucumber in half lengthwise; cut crosswise into thin half-moons. Place in plastic bag and refrigerate. Combine orange juice, lemon juice, honey, mustard, orange rind and salt in small bowl. Whisk in oil until well blended. Refrigerate until ready to use. Pour about half the dressing over lettuce strips; toss to coat. Arrange cucumbers in circles in center; arrange shredded beet around cucumber. Serve with remaining dressing. Wrap garlic cloves together tightly in foil. Trim beet stems to 1 inch if necessary and scrub beets. Wrap beets together tightly in foil. Roast garlic and beets in middle of oven until garlic is soft, about 30 minutes. Remove garlic from oven and continue to roast beets until very tender, about 45 minutes more. In a saucepan cover potatoes with cold salted water and simmer until tender, about 30 minutes. Drain potatoes and keep warm, covered. Unwrap garlic and peel skin from cloves, transferring garlic to a food processor. Unwrap beets carefully and, when cool enough to handle, slip off skins and stems and discard. Reserve 1 beet. Quarter remaining beets and add to processor. Peel and halve potatoes. Add potatoes to processor with vinegar and milk and pulse until mixture is just smooth (do not over-process or potatoes will become gluey). Transfer purée to cleaned saucepan and stir in lemon juice, 2 tablespoons water, and salt and pepper to taste. Heat purée over low heat, stirring, until hot. Stir in 2 tablespoons water and add enough remaining water to reach desired consistency. Cut reserved beet into 8 wedges and serve with purée. Serves 4.